> Ever went Go-Karting...On a cruise? Ever went Go-Karting...On a cruise? You can do a lot of things on a cruise ship nowadays. Ice skating, surfing, and rock climbing have set sail alongside the usual cruise ship activities of eating, drinking, tanning. 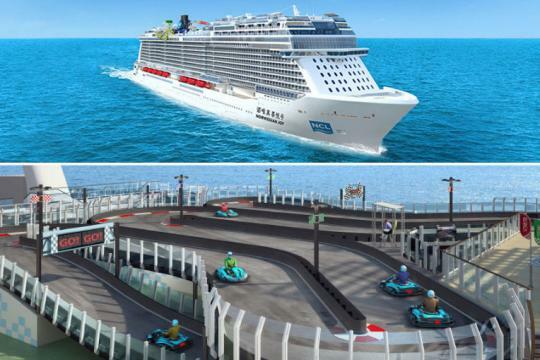 But Norwegian Cruise Line is adding something that caught our attention – go-kart racing. The new gimmick will be aboard the Norwegian Joy, a 168,000-ton, 20-deck liner. Its two-level kart track has what looks like seven to eight turns, based on the image above. It's a fine looking little circuit, although it looks a bit narrow – we wouldn't count on much wheel-to-wheel racing. The elevation changes are appealing, though. The Norwegian Joy will be able to carry 4,200 passengers and 1,700 crew when she sets sail in summer 2017. The hulking cruise ship is 1,069 feet long, or just 23 feet shorter than a Nimitz-class aircraft carrier. As for activities aside from karting, Norwegian Joy will feature bumper cars, a 360-foot water slide, simulators, two casinos, and luxury retail outlets. And for the ultra-wealthy, there's The Haven, which is made up of 74 private luxury suites, all serviced by a butler, and includes private lounges, pools, dining areas, and a third casino. There is a catch, of course. Norwegian Joy is only slated to sail from Shanghai and Beijing, but detailed itineraries haven't been published yet. Still, if you're looking for a truly bizarre sensation while racing, you'll want to book passage on Norwegian Joy and give driving a kart on a boat a try.